It is a day-by-day process that can lead to grand one-time events, but doesn’t have to or need to have such grand moments. Indeed, such highlights can distract you from the nuts and bolts of a real ongoing leadership mindset. It goes on without limit. You can have results that mark milestones, and wonderful successes that everyone notices. But leadership goes right on through those and must keep thriving in the shadows of those great events. Leaders are not the source of productivity and innovation. Their people are. Leaders are the catalyst that unlocks the people’s energy and gets it focused in the right direction. 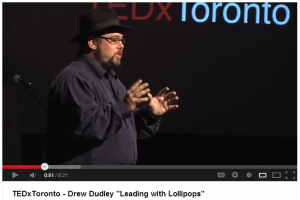 Watch the video, which features a speaker named Drew Dudley speaking at a TEDx talk in Toronto a few years back. Let us know what you think! Spot on? Too simplistic?